Tom is telling him that Garry and Suzette are going up and Suzette is going home. Tom has no idea if Suzette wins POV who the replacement nominee will be .. It’ll either be Aneal, AJ or Andrew. Emmett thinks that Andrew would be a good player to backdoor because he’s got a bit of play in him. Tom doesn’t think it’s a good idea to put up Aneal again as the pawn it’ll jeopardize the relationship they have. Suzette insinuates that it has been confirmed from production that TOM has made remarks about her being personally. Suzette says that people know what she has to deal with in this house. 8:10pm Kitchen Talla, Aj and Topaz Talla is farting up a storm. 10:30 Guess what.. hush hush it’s either a Willie moment or they’re hiding all the arguments from us so they can use them on the show. 10:22pm Feeds come back for about a minute Suzette and Garry on the couch not looking happy. Has afterdark been live or pre recorded? I was streaming the first night but then found out it was from previous in the day. Simon it is pre recorded. Something must be going on. It kind of reminds me of the Chima or Willie incidents. The feeds were down a long time. If this was BBUS I would be bitching because I pay for the feeds. Can’t really complain if it’s free though. I hope they let us see if there is drama happening! I’m definitely happy that the feeds are free but do all the cameras have to be on one room?? Isn’t the point of having 4 cameras is to see 4 different things going on?? I like how the BBUS has their feeds. You have the 4 cameras and then you can click on one box to view all 4at once. I also like the flashback option. But again this is free so cant complain. 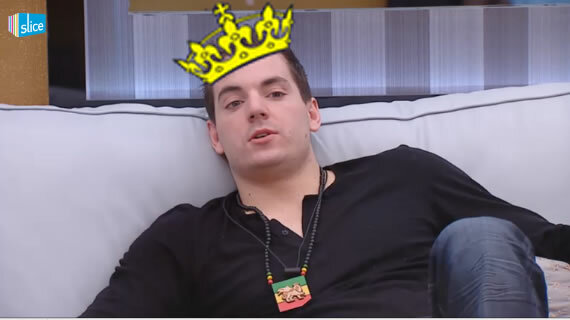 Maybe next bbcan the will work out the kinks. Is Topaz ever going to get out of that bathrobe? She has been in it all day today/ Does she own any clothes? Great when the feeds do come back up we get the pleasure of seeing Tom being rubbed down by Liza. So now production is snitching on certain players? I bet they haven’t told Tom the vile things Suzette said about him and the girls of the house. Pretty f’d up that production has a bias for certain players. I’ll be surprised and shocked if they didn’t create a POV specifically for Suzette to win (see: Chicken George in BB All Stars). How can anyone like her? She has fans? Really lol…all she sees is that she’s aboriginal and he’s white. That’s the only way she looks at it and is probably the reason why she hates him. I hope she doesn’t have non-aboriginal fans…because she probably hates you too. Big Brother Canada: After over 5 hours Down the Live Feeds are Back – Toms Target Changes!